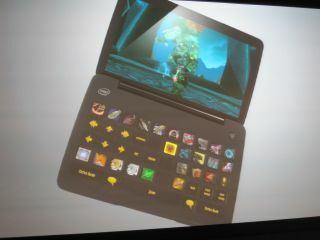 We grabbed these snaps of Razer's prototype gaming "netbook" from the CES show floor. We couldn't have a play with the device as it was sat in a reflection-tastic glass case though, as you'll see, there was a guy on hand to polish the glass as we left. The Switchblade has been developed in cahoots with Intel, who have provided an Atom chip for the prototype. But it's not clear who's providing the graphics power inside the diminutive PC. To describe it as a netbook is a bit of a misnomer, as Razer intend this machine to replace the traditional mouse and keyboard combo for gamers. It's also smaller than a standard netbook – the screen is a 7-inch display - and is more like a handheld. There's a "ultra-sensitive multi-touch screen and dynamic tactile keyboard" alongside what Razer says is a user interface that can adjust the layout of the keys on-the-fly depending on the game mode.